One third of thickness of other condoms, Unique are the thinnest condoms in the world. They are also odorless and transparent. It feels like you are not wearing anything at all. Worry less with Unique. Unique is made with a polyethylene synthetic resin. The condom is latex-free, hypoallergenic and vegan. It is three times stronger than standard latex thus reducing the chances of breakage. The right fit matters. Unique comes with three sizes to accommodate different body types: regular / larger fit, longer fit, and slender fit. 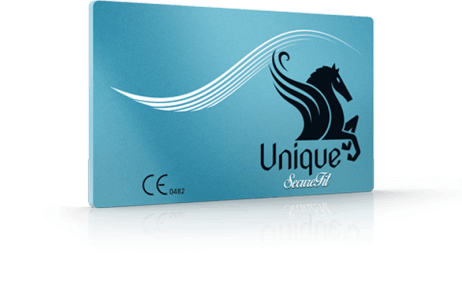 Unique comes discreetly packaged with 3 condoms in a credit card size format. Safely carry 3 condoms in one package in your wallet or purse. These condoms are great! My partner says it feels like theres no condom there at all! Super thin and eay to put on. Love how it makes me feel closer to my partner, rathen than feel like there’s something in-between us. The fit is perfect, the feel is nonexistent! The feel is awesome, there is lots of heat transfer and my wife loves them because they feel good compared to some of the mainstream condoms. © 2019 Unique Condoms. Web design by Numinix.